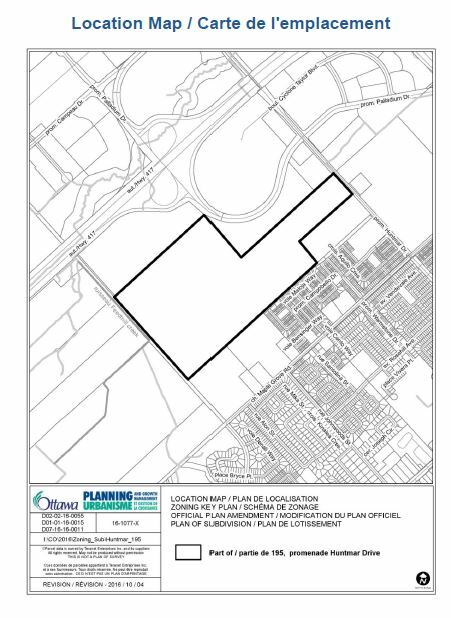 The City has received Development Applications for the property at 195 Huntmar Drive which is located west of Huntmar Drive and south of Highway 417. The site falls within land covered by the Kanata West Concept Plan. The subject property is currently a vacant parcel of land approximately 54 hectares in size with approximately 153 metres of frontage on Huntmar Drive. The City of Ottawa has received three associated applications including an Official Plan Amendment, a Zoning By-law Amendment and a Plan of Subdivision application to accommodate the development of a mixed-use subdivision comprised of employment, commercial, low to high density residential uses and a district park. The subdivision application would create blocks to be developed with residential uses including detached, townhouse, stacked townhouse and low-rise apartment building, a commercial block, three blocks for automobile dealerships and a district park block. Approximately 1120 residential units are proposed which consist of 174 detached dwellings, 285 townhouse dwellings, approximately 520 stacked townhouse dwellings, and approximately 140 units in low-rise apartment buildings. The detached dwellings are located at the center of the site, the townhouse and stacked townhouse blocks are located throughout the site and the low-rise apartment blocks are located abutting the commercial block along Huntmar Drive. The commercial block along Huntmar Drive would be 2.5 hectares in size and would accommodate a range of small scale retail, restaurants and service commercial uses. The three automobile dealership blocks would be approximately 2 hectares in size and are located west of the future North-South arterial roadway. The district park block would be 11 hectares in size and located in the northwest portion of the site. The subject site includes the future North-South Arterial Road which bisects the plan of subdivision and connects to two collector roads, including the Stittsville Main Street extension. The subject site is currently zoned Development Reserve Zone (DR) per the City’s Zoning By-law 2008-250. The purpose of this zone is to recognize lands intended for future urban development in areas designated General Urban Area in the Official Plan, and a range of permitted uses is limited to those that will not preclude future development. For more information you can review the reports by searching the City’s development applications website at www.ottawa.ca/devapps . Please provide comments by November 14, 2016 to City Planner, Louise Sweet-Lindsay at Louise.Sweet-Lindsay@ottawa.ca or 613-580-2424 ext. 27586. Please note a public meeting will also be held in the future where the public can also provide input.